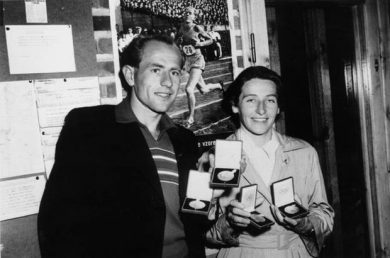 Dana Zátopková is 96 years old today; her celebrated husband, Emil Zátopek would have been 96 too, since by coincidence they were born on the same day, just a few hours and a hundred kilometres or so apart. Her status as an elder stateswoman of the sport seems to contrast with her beginnings; because apparently Dana was a bit of a tomboy in her youth, dashing around, according to her mother in the most unladylike fashion. But that dynamism (and her mastery of the popular songbook of the period) attracted Emil, and has doubtless contributed to her longevity. Equally, his unbelievably onerous training programme may have contributed to Emil’s relatively early death, aged 78, in 2000. A real ‘character’ herself, most of her life Dana had to play second fiddle to her ebullient and talkative husband. But she had her own moments in the sun, not least when she won the Olympic javelin title in Helsinki 1952, just after Emil had won the 5000 metres, the second leg (between the 10,000m and the marathon) of his unrepeatable Olympic treble. Even then, Emil had won three golds to her one; and he joked that the 5000m only made it 2-1, and he needed that third victory to emphasise family superiority. But he went a step too far when he attributed her victory to himself. Her riposte is typical of the sense of humour which endures to this day. Here, beginning with the prelude to the 1952 Olympic javelin final, is the relevant extract from my book on Zátopek, QUICKSILVER*.  ‘… The final of the women’s javelin was due to begin concurrent with the 5000 metres, and as she (Dana) records, the last thing she needed was the sort of cliff-hanger finale that Emil had stage-managed so adroitly. ‘That´s terrible, she wrote in their autobiography, ‘That Ťopek (chohpek, his pet name) always makes it so exciting that the whole stadium is on its feet. When I see him chasing like that my knees are shaking. With that, I won’t throw any distance at all’. ‘I was trying to comfort her,’ wrote Emil, ‘telling her to stay calm, because she’d lost before and I wasn’t going to win the 5000 metres anyway. At the finish I recognized, to my delight, my mistake. When I looked around the stadium, I didn’t see either Dana or the other javelin throwers. We met in the changing room after the award ceremony. I wanted to ask why the javelin had been delayed but I couldn’t get a word in edgeways. She jumped all over me, she was so thrilled. “You really won it! That´s wonderful! Show me the medal!” And there she was, putting it into her bag. For good luck, she said.